Almost five weeks after Daniel S. Mun ’05 disappeared, there is still no indication of his whereabouts, said Arthur L. Jones, director of the MIT News Office. All members of the Delta Kappa Epsilon fraternity have secured housing for the spring term, said J. Brandon Hohm, president of DKE. Michael A. Sullivan was elected to a second consecutive term as mayor of Cambridge by his fellow city councillors at Monday’s inaugural council meeting. 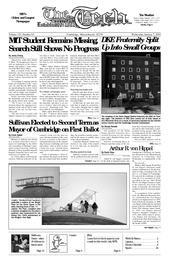 Sullivan defeated a bid by perennial mayoral hopeful Henrietta Davis and was elected in a 5-4 initial vote. Arthur R. von Hippel, a pioneer in the field of material science who founded the Laboratory for Insulation Research at the Massachusetts Institute of Technology, died Wednesday of complications of the flu. Do We Need More Than Just Mens et Manus?